Depart from your Shanghai hotel in a comfortable, air-conditioned vehicle and venture to the airport to board your flight to Beijing. Relax during the short plane journey then greet your knowledgeable guide on arrival in Beijing. Set out on your enlightening exploration of the city immediately, heading first to the mystery-shrouded Forbidden City. Marvel at some of China’s best preserved ancient buildings and hear of the complex’s prosperous yet turbulent past, which dates back to the Ming Dynasty. 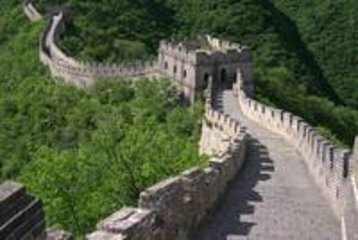 Revitalize with a delicious Chinese lunch then board a comfortable vehicle to drive to the Great Wall of China, an ancient architectural feat cradled by rolling hills. Gasp as you see stonewalls stretch over 5,500 miles (8,850 kilometers) and admire the impressive scenery that surrounds the serpentine structure. After your invigorating hike around one of the world’s wonders, return to Beijing International Airport and board your plane back to Shanghai. Return to your hotel in a comfortable vehicle with incredible memories of your day in Beijing. Huge day but worth it if you are limited for time and want to see 3 key parts in and around Beijing. Very fast paced but there is some rest time when you are driving. Everything is taken care of for you. You are collected from your Shanghai hotel and taken to the airport and checked in and then greeted in Beijing. Just be prepared for a long day. Our day started at 6am and we were returned to the hotel in Shanghai at 1.30am the next morning. Our guide, Gale was awesome!!! Made the experience! Her knowledge, attention and care, not to mention her fun and friendly attitude will not be forgotten. Thanks for making our day fabulous Gale!. Very long day. Worth it. We saw Tianaman Square, The Forbidden City and the Great Wall of China.Fabulous experience. Guide very good. However did not expect to go to a silk factory or a jade factory especially as there was a very hard sell. One day is certainly not enough for this trip. Getting up early wasn't an issue and our driver to/from Shanghai was helpful in getting us all the way to the security point at the airport. When we arrived at Beijing our guide picked us and and drove us to our first destination. So far, so good. We stopped at a silk factory where they spent heaps of time selling us items. We then went to the Forbidden City, this was where the tour went down hill. The line to get through security was massive and our guide literally pulled us through the crowd knocking over people including children so that we could get through on time. Once we finally got through she then walked at such a pace that we didn't get to see or hear much about the city at all, only stopping for a photo or two. In total we were in there for an hour max. Next we drove to a Jade factory where they proceeded to take their time trying to get us too buy items we didn't want. Where are the priorities?? We came for the Forbidden City not to spend our money in factories built to sell to foreign tourists. Because of the time spend here we had to go to a smaller section of the Great Wall. Here our guide left us at the gate and just gave us a time to meet her. We paid for a tour guide to show us these places and tell us about them not dump us there. Lastly was a tea house, again designed for tourists. Should we have spend our time in these factories being pressured to buy or should we have spent more time at the attractions we paid to see?? We were then almost left at the airport with no information until we asked the guide to come in with us to help. I would not recommend this tour to anyone. I have done day trips of cities before in multiple countries but there is just not enough time in the day for this one! The guides are obviously getting commission on what we buy and have their priorities completely out of whack. If you wish to visit these places make them day trips each on your own. Was picked up by guide at hotel lobby. Were driven to airport where he guided us through line to pick up boarding passes and got us to security. Met at other end by cheerful, friendly guide who took us to van. First stop was a government owned silk factory. Fairly interesting but the hard sell to buy a comforter was annoying. The scarf prices were better than Silk King and quality was good so grabbed one. Then on the Forbidden City. This MUST be experienced to be believed. Photos cannot convey the awesome scale of the place. Guide had good information and helped us find a calendar in one of the onsite shops. Then in the van to the jade factory for a really mediocre lunch bring your own snacks! The real hard sell came in the enormous but empty store where the manager could focus his whole attention on us. Nothing interested us but he REALLY wanted to sell us something. Sorry, no sale. Then a very short ride to the mountains outside the city to the wall. The wall is....steep. Breathtaking....literally. Wear comfy shoes and be ready for a workout. But worth every moment. There is no way we could have managed this day on our own. We have had the cousin-in-law tequila factory/souvenir stops in Mexico as well so that's the price one has to pay for the service. The language barrier makes China more challenging than other countries as well so a guide is almost a necessity. Went to Souzhou on our own and just buying train tickets was an adventure NO English signs in Souzhou station! Will continue to use Viator as tour company of choice! -- We were picked up in Shanghai at our hotel and escorted to the airport. Our guide was quick and smart and thorough. We had zero issues on the Shanghai side on both ends of the day. The Beijing was another matter altogether. -- We were picked up on time in Beijing and driven immediately to some silk scam shop, where we were marched through a 2-minute explanation of how silk works the same explanation about worms and larve and moths you saw in 2nd grade and then held hostage inside as we were expected to buy poorly-made silk products one could find in any Chinatown shop in America. We were HOUNDED by several touts in this shop who were relentless in their effort to sell us this garbage. -- Since we had to get up at 4am to hit the airport in time for our early flight, we hadn't eaten breakfast yet. When we asked to stop to get something to eat at about 10am, we were told we had no time and had to wait for lunch later -- and that it was better for us to wait because we could eat more food when we are hungrier. -- We were then driven to the Forbidden City and dropped off on the street several blocks away from the entrance. We were then marched to the front gate by our shockingly empty-headed guide who seemed to be obsessed with how many babies the various princesses had, but offered little else about the City or the fact we were standing right in Tiananmen Square or across the street from Maos tomb or anything else of relevance. -- Once inside the Forbidden City, our guide continued on about the babies, didnt know much about the individual buildings and encouraged us to take a lot of selfies. We were inside the City for about an hour when we were told we needed to shuffle off to our next destination. So, we were marched outside the wall again, back to where our driver had parked the car. -- On the march back to the car, we saw several shops, etc. where we could grab a snickers or whatever to stave off the hunger. But, we were told that food was dirty and that we needed to wait for the official lunch. -- We then started to make our way to the wall by car or at least thats what we were told. At some point our guide made a phone call where she pretended to arrange for our lunch at a restaurant. -- An hour or so later, our driver pulled off the highway to a largely empty parking lot that surrounded a large building. We were told this was a our lunch stop. Once inside, we were shuffled into a room and told to sit down. Another woman walked into the room and started a spiel about jade and how to tell good jade from bad jade, the history of jade, the importance of jade, etc. Still no lunch. -- Then we were corralled into a massive warehouse where, of course, several touts were trying to sell us jade at highly inflated prices. -- Once we spent about 30 minutes literally pushing the salespeople off of us, we were escorted into an adjacent building where lunch would be served. We saw no menu and were offered no choices. Cold dishes of food that had been prepared several hours earlier were flung onto the table. We ate the rice and left the rest of it, which was horrible. So, so much for the theory that it was better for us to wait because we could eat more food when we are hungrier. -- Finally, we were back on the road and off to the wall. We were told that because it was so late in the day and because traffic back to Beijing would be bad, we could not go to the back part of the Wall where most people go, that we should go to the beginning to save time. -- At the beginning of the Wall we were given 45-minutes to walk around and be back at the van. We did that and got back in the van, where we we told we could just sleep because there was SO MUCH TRAFFIC. -- An hour and 15 minutes later, we arrived at the airport more than 4 hours before our flight. We were dumped off outside the airport where we were told we should just look around for our flight and gate by ourselves and that we should give the driver a big tip. Highly recommended although seemed quite expensive for a day. Both Maria the guide and the drivers were excellent, and I manages to see the Great Wall, a jade factory, the Olympic Park and the Forbidden City all in one day. I was taken to the airport far too early but I do understand that Beijing traffic can be very temperamental. It was an interesting day, very fast paced. It did not start out great though.... At 5:30 am, on our way down in elevator, when the doors opened, the Guide that was shuttling us to airport said You are late. It turns out it was 5:32am-Apple time. Not a pleasant start. At airport we were given paperwork, but struggled to get past security as the paper barding pass was not accepted. After 3 tries of very mean airport personnel, we finally were able to get on. I personally think, that you know your own airport, Guide should have helped us print a boarding pass at the airport. Shanghai airport everyone is pushy, rude, and have no sense of personal space at all-to the point of feeling uncomfortable. Ran to gate, and got on plane, but we thought we would miss the plane with all the back and forth with boarding pass. Guide in Beijing was good. Great Wall was amazing, as were T Square and Forbidden City. Lunch at a Jade Store was good, but salespeople were indeed pushy, and follow you around the entire store. On our way back we were dropped off 3 hours prior to departure, which was a bit early. We could have gone somewhere else as we are only in Beijing once. Once dropped off at airport, Guide was in extreme hurry to leave us. Above complaints I am providing as this was an expensive tour and the described airport experience make a huge difference on stress and in how you spend the day. For an EXPENSIVE private tour, you are not treated well. For starters you are picked up at 4:30 in the morning. No time for breakfast, nor is anything open. The drivers or tour guides do not provide you with water, which you can not take on the plane. They are also put off by the suggestion that as tour guides, especially in the hot summer, they should have had some water. Second, they really do not treat this as a private tour. For starters they had miscommunication from the tour company that we did not want to go to the Great Wall. I have no idea where they got that from, but after a while of straightening it out they got us to it. We were rushed through the Forbidden City. Did not have a chance to look at anything. Also, early in the tour we told them that we were not shoppers but was still forced to go to a jade factory and a tea house. These are like any other tour shopping stops except when there are only two on the tour, the sell gets much more aggressive. The delicious Chinese lunch as described by the tour was in the jade factory and it was pretty much a general tso's chicken like we get in America. Then we were just dropped off at the Great Wall and that was it. Why couldn't we have gone to the Temple of Heaven instead of the two shopping tours? Why was our return flight not until 9:30pm and forced to stay at the dingy Beijing airport for an excessive amount of time? SAVE YOUR MONEY AND DO NOT BOOK THIS TOUR!!! Great tour, started a little early. Delivered as promised airfare, airport driver, tiananmen square, forbidden palace and great wall all by a knowledgeable english speaking tour guide. Only other complaint is the standard tour of a jade factory and silk factory. Really just a slightly pressured sales trip after the tour which only lasts five minutes. This was a fabulous trip. Our tour guide, William, really took the time to make it a special experience. We had crazy weather with snow so our plans were deterred and our return flight to Shanghai was cancelled. We felt no stress and William and the tour company took care of everything. Even down to him running around the airport and staying with us until we were completely set on our new flight. He asked us what was a must so we did get The Great Wall and it was magnificent covering in snow. Despite low temperatures we had an awesome experience and would highly rec this tour if you only have one day to get to The Great Wall Don't miss it!